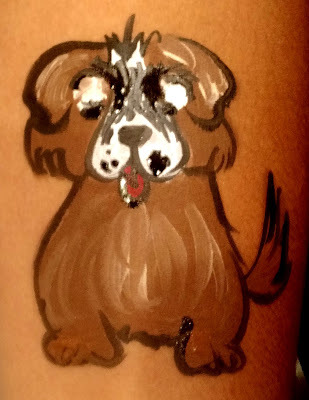 You can never have too much practice, and I've joined a challenge for the next month, with one of my body art Facebook groups, to do some sort of body art practice every day. 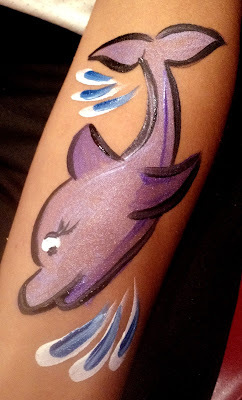 So on Tuesday evening, I pulled out my face paints, especially some new colors and brands I have, and practiced some sea life cheek art. 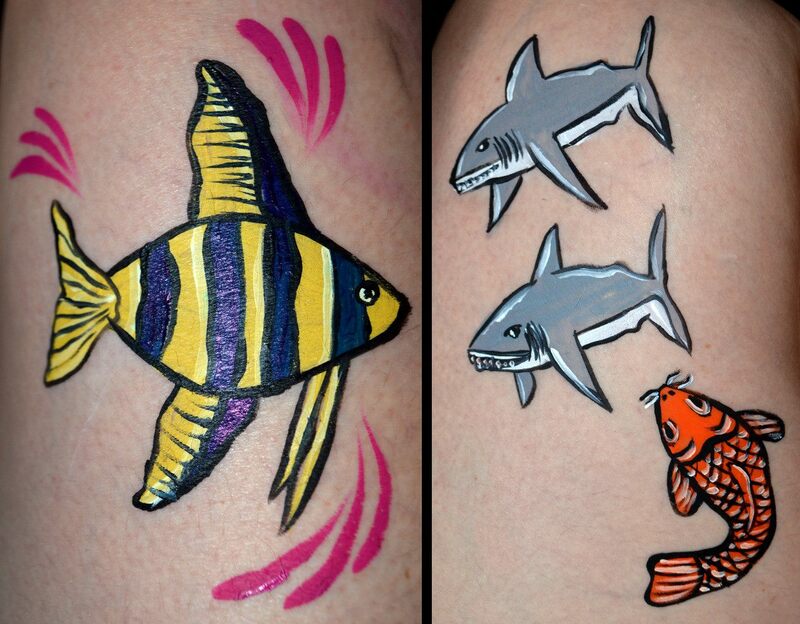 I felt like my sharks were in a rut and wanted to try something new... so I did! And then I kinda kept going. Real henna, good henna, never comes in black. You'll see what's billed as "black henna" by unscrupulous henna artists who want to cater to the public's wish for instant gratification, even if it does harm to their customers. Drives me up the wall. Here's why. Real henna, good henna, is always a greenish-brown paste, made from simply plant powder, essential oils, and lemon juice. When it's drawn on, it looks like this. 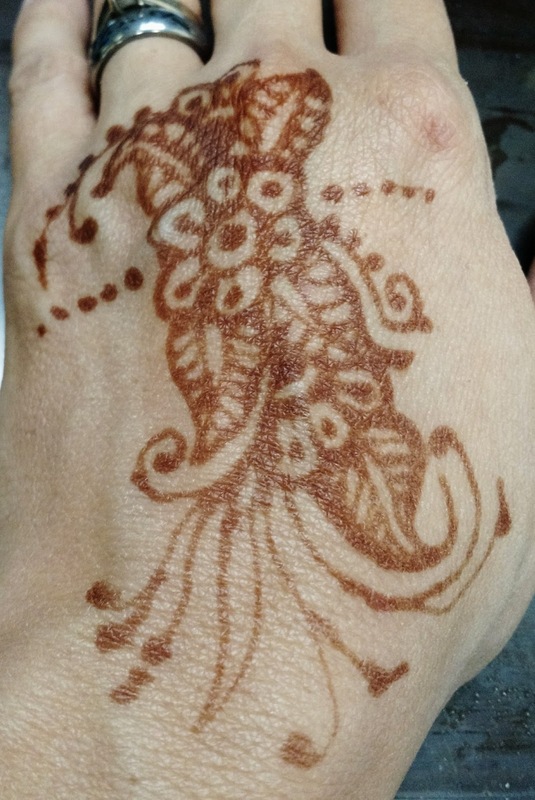 I did this flower on my hand last night. When the paste flaked off several hours later, the stain looked like this, a cool bright orange. And today, this is what it looks like. A nice, brown stain that should get a bit darker over the next day or so before it starts to fade... although where it is on my hand, it's likely this one will last close to three weeks! My only lament? I'm not ambidextrous and can't do another on my right hand! 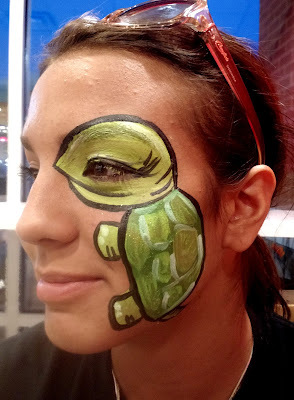 Quite a while back, I face painted at an annual corporate party for a company that's hired me for their holiday party for many years. and Nathan Evo of Hero Factory. I had a great time again Friday evening, face painting at Cherry Reds in Wyckoff. As an aside, I highly recommend the blueberry, strawberry, and banana smoothie, which is my absolute favorite. 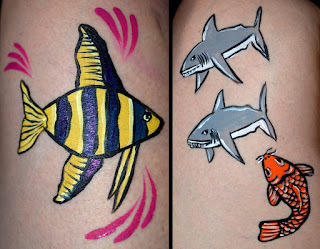 My first "customer" of the evening was one of the owners, who suggested a koi - my very first time painting one! 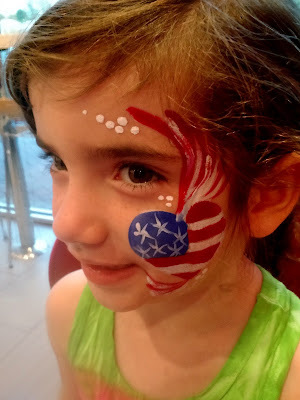 And then this little cutie's grandma suggested something patriotic for the holiday. Good thing, too, since at my actual annual July 4 event at the Indian Trails Club, we were so slammed I didn't have time for a single photo! Without this one, I'd have no patriotic photos at all this year. Later in the evening, a contingent of teens came in, some of whom were visiting from Texas. Great group of girls, and so fun! I had several events last weekend, but only took photos of one painting, because it was too adorable - and funny - not to! 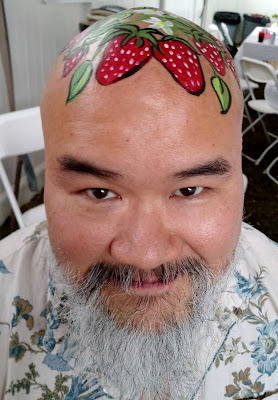 The theme of the first birthday was "Strawberry Social," and this friend of the family took it in stride. 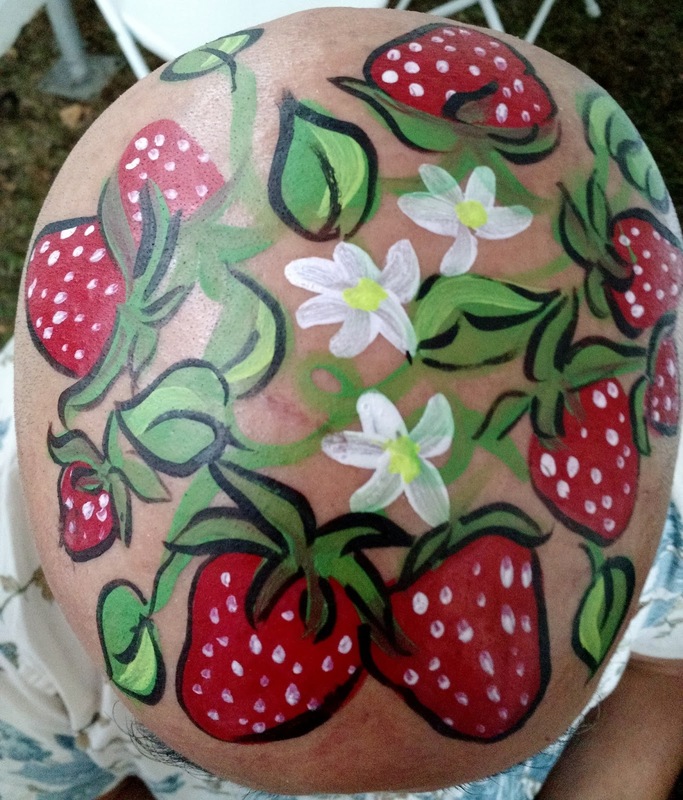 There's seriously nothing better than an adult with a stellar sense of humor, and nothing more fun to paint than a bald head. It was a great compliment too, as he's an artist in his own right but was impressed with my work!